Today we have picture book author Laurie Hallmark with us, sharing about her award winning picture book, ADA BYRON LOVELACE AND THE THINKING MACHINE, illustrated by April Chu (Creston Books 2015). Be sure to enter her giveaway! I came late to writing for children. As a child, I wrote some songs and poems, but that was about it as far as creative writing. I was more interested in math and science. My undergraduate major is in Biochemistry, and I have a Masters in Information Systems. I’ve always enjoyed reading kids’ books, though. When I thought of an idea for a middle grade novel back in 2001, I thought I’d give it a try. Over the years, I studied many children’s books and took many writing courses to improve my craft. I recently received my MFA in Writing for Children and Young Adults from the Vermont College of Fine Arts. We love ADA BYRON LOVELACE AND THE THINKING MACHINE. Congrats on the excellent rave reviews it's gotten. Tell us what inspired you to write this story. For many years I was a computer programmer, and I now teach computer science. Ada Byron Lovelace was the world’s first computer programmer. 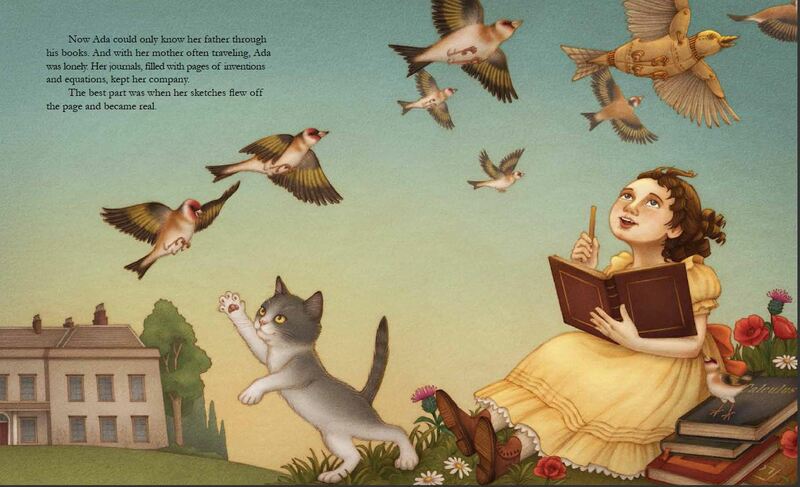 Ada seemed a natural fit as a first subject for a picture book biography. You also write MG, nonfiction, and poetry. How do you decide what form your creations take? It’s not always easy. I had considered writing Ada as a middle grade, but decided I wanted a younger audience to benefit from her story. After all, prejudices about women in STEM (science, technology, engineering, and math) come early. Hence, I chose a picture book format. That being said, I’m now writing a young adult novel in verse about Ada. Many parts of her story are inappropriate for younger children, and this format allows me to go into more depth with the story of her life. As far as poetry versus prose—the scenes came out in verse, so I left them that way. What was the hardest part of writing ADA BYRON LOVELACE? Since this was my first picture book biography, it took me a while to figure out how to write this type of book. My first draft sounded like a twelfth-graders school paper. I was able to bring the age level down to about eighth grade, but it still read like a report. Next up, a draft that could have been ripped from the pages of a fifth-grader’s diary. The learning curve on writing a picture book biography was definitely the hardest part for me. The easiest part was writing the author’s note and description of the world’s first computer program in the back matter. I had more experience with this type of “just the facts” text, so I didn’t face the steep learning curve like I did with writing the book itself. I have a picture book biography of Grace Hopper coming out in Spring 2017. Just this week I was working on where the page breaks should go. I’m also in the early stages of writing a picture book biography about another woman in STEM. That’s simple. Read, read, read, and write, write, write. Concentrate on reading more recent titles, since styles and tastes in children’s books have changed through the years. And write any chance you get. 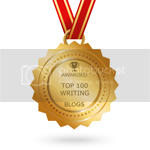 Don’t worry about whether your writings will get published. 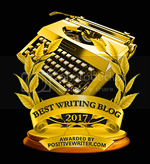 You need to exercise your writing muscles. I’m a very private person, so there are many things people don’t know about me. 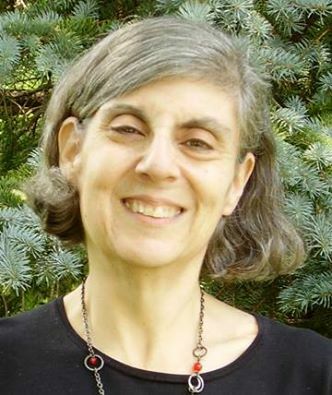 Laurie Wallmark writes picture books and middle grade novels, poetry and prose, fiction and nonfiction. She has an MFA in Writing for Children and Young Adults from Vermont College of Fine Arts. When not writing, Laurie teaches computer science at Raritan Valley Community College. 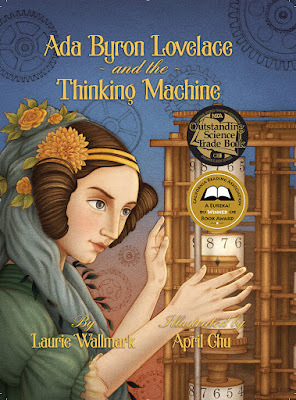 Her debut picture book, ADA BRYRON LOVELACE AND THE THINKING MACHINE received four starred trade reviews (Kirkus, Publishers Weekly, Booklist, and School Library Journal) and several national awards. It is a Cook Prize Honor Book. So nice of you to share your process with ADA, Laurie, especially how the text first came out much older and you had to keep working with it until it was suitable for a younger age. A wonderful example of always keeping your audience in mind. Nice to know that you're working on other PB bios! Wonderful post - love to hear about your book and your journey. I have your book in my personal library and I read it over and over, Laurie :) You encourage and inspire young minds with Ada's story. April's beautiful illustrations give vibrancy to Ada's life. I look forward to reading your new book! I really enjoyed hearing about the details of writing a science-oriented picture book. Thank you. Great interview and congratulations on such a wonderful book! Love this interview! Ada Lovelace is such an important story to share! Congratulations! It looks like a lovely book! Love love love this book. Thank you for sharing your process, Laurie! I've had this on my list to read...a win would be great! Thanks for sharing. I think my husband (a math major) and my daughters who also love math would want to read this book too. Laurie, I'm anxious to read this book! I'm so glad you wrote this as a PB so kids will know about the possibilities available to them. Hi Laurie, Thank you so much for sharing your story!